Your dumbest moments couldn’t hold a candle to their’s. Lloyd Christmas (Jim Carrey) and Harry Dunne (Jeff Daniels) are complete buffoons trying to make a living in Providence, Rhode Island. Lloyd chauffeurs esteemed people around as a limo driver, while Harry gets by as a pet groomer in a van completely redesigned as a “sheepdog.” Lloyd makes a scene after retrieving the briefcase that a woman, Mary Swanson (Lauren Holly) left behind at the airport, while Harry has ruined the grooming of dogs that were scheduled to appear in a dog show. After the day’s events, both come home to their rinky-dink apartment jobless. It is Lloyd’s mishap that changes things for the buddies forever. He has unknowingly ruined a ransom situation. Of course, he possesses the money in the bank briefcase, and to send a message, those crooks take out the beloved parakeet Petey. With hardly anything left to stay around for in Rhode Island, Lloyd convinces Harry to travel cross-country to Aspen, Colorado, where Mary resides in an effort to return the briefcase to her. The only thing smaller than their cross country travel budget are the brains that belong to these two. 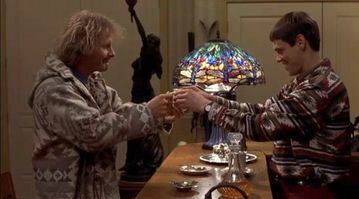 With Dumb and Dumber To on the very near horizon (at this time of writing), yours truly felt like it was my duty to rewatch Dumb & Dumber in preparation. If you spoke to my family, they would tell you that I watched this quite frequently as a kid on VHS, and enjoyed it immensely then. It has been at least a decade on my end since this was last viewed, but there was no question in my mind that it still would be good. How good was the true question. After checking out recently, honestly it is just as good now as it was before, if not even better. For comedies (but any movie really, but especially comedy), one can only speak for themselves as to what makes them laugh and how much. 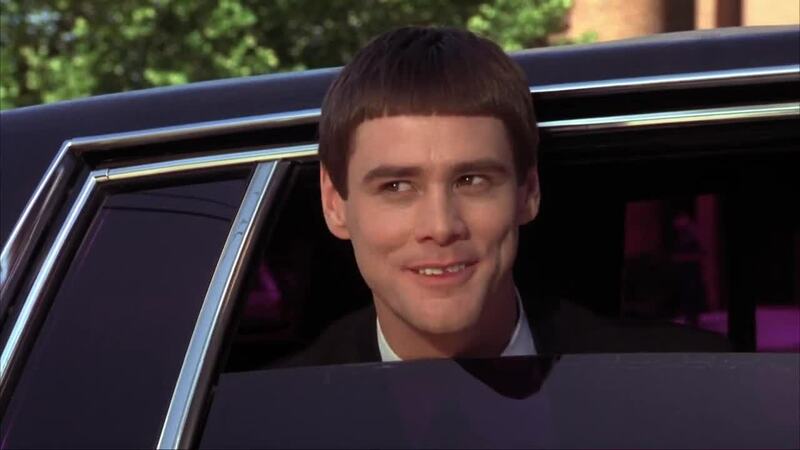 To me personally, Dumb & Dumber is easily one of the hardest films I laughed along with hardest, for multiple reasons. From beginning to end with this, there are numerous scenes and moments forever etched in my mind. A big part of that happens to be the still wonderful and gut-busting-dialogue written by the Farrelly brothers. Similar to a sing-along, I was recalling almost each line as soon as Lloyd’s pumpkin-pied haircut-head stuck out ever so slightly from the limousine. Nothing feels dated at all, and the fact that so many lines are so immediately recognizable whenever someone says one in everyday life hints toward the fact that D&D struck a humorous chord with many people. Supplementing the superb dialogue is the reactionary humor found throughout. 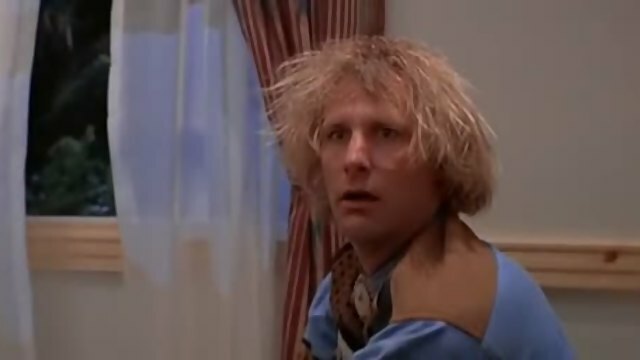 Both Jeff Daniels and Jim Carrey play off of each other really well, but others such as Lauren Holly and Cam Neely (Sea Bass) also are very adept at flashing the right expression at the right time for maximum laughs. And really, some of the more funny instances hardly have any dialogue at all, just accompanied by a nice piece of music. The score for this is one thing that almost always seems to be overlooked. Who can forget the wedding bells track plated numerous times throughout? Or when Lloyd makes his mad dash to get the briefcase back to Mary? It is catchy, adds to the hilarity, and the actual licensed music feels like stuff that would be listened to on an extra long road trip by these guys. “2 Foot ‘O Buttcrack” along with others will always live on thanks to D&D. It is a buddy comedy through and through, with a wacky story. In other movies, this wackiness may be hard to pull off or buy into. But with characters this dense and oblivious, nothing is off the table whatsoever. It helps that there is something clear and somewhere specific these guys need to do and get to, however asinine it is. 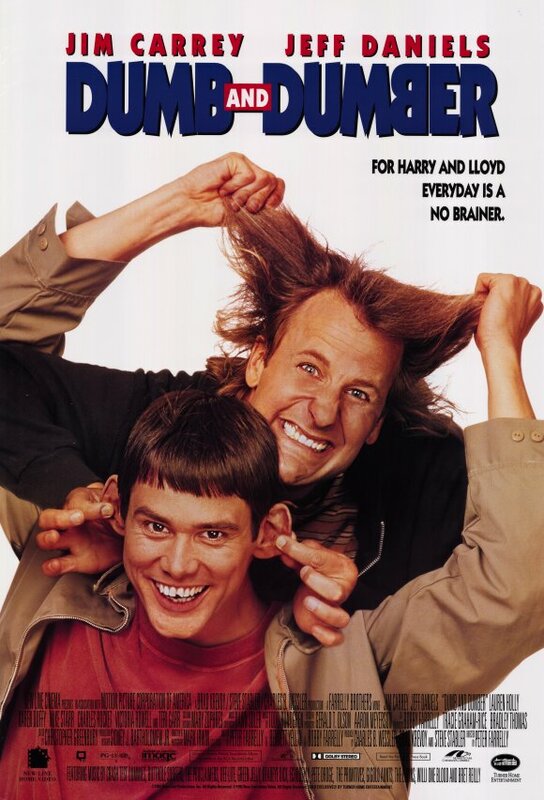 Enough cannot be said about Jeff Daniels and Jim Carrey. Both have done a lot of different things in their respective careers, but their work here is up there as their most recognizable. The characters they play are idiotic and maybe pathetic losers, but lovable pathetic losers who make the audience want to see them find good fortune in Aspen. Lauren Holly is solid along with the other who appear here, but Cam Neely and Harland Williams (Sea Bass and the state trooper, respectively) completely steal the show in their limited time on screen. Even almost 20 years later, Dumb & Dumber remains just as memorable as before, perhaps almost more so as more lines make sense now at an older age. If never seen before, there’s a chance, and I think it is higher than one in a million, that you’ll enjoy this a lot as well. Photo credits go to rottentomatoes.com, moviepostershop.com, and metacafe.com. This was I think the first movie I ever walked out of .. ha! I’m dead serious and I remember we had gotten invited by Steve Tisch to the screening and we never told him we did that.. eeeek.. Sorry..
Hey everyone’s different, especially with comedy! No sorries needed. I’m guessing D&D2 doesn’t interest you then right? A very funny movie. God, I hope this sequel isn’t terrible. Nice review. Thanks for the comment Dan. I hold out hope, not that it will good as this, but just that it is competent. I try to be an optimist, but the more I’ve seen of previews I shudder slightly more. We’ll see! I like toatlly over the top comedy and this one takes the cake. It also makes me feel good because anything stupid I do in my life, I can always say, at least I’m not as dumb as Harry and Loyd, lol! I truly believe this gets funnier and funnier as time goes on. Top-notch comedy in my book, thanks for the comment bro! Excellent review dude. Love it. I truly feel this gets better and better. Thanks for stopping by. One of the best comedies ever. Still not have watched the sequel, but looking forward to watching it.